The Chicago Bears have had one of the most impressive and focused offseasons of any franchise in the NFL. They made an aggressive move a season ago to move up in the draft and secure their franchise quarterback in Mitchell Trubisky. The 2017 season was not kind to Chicago, and it cost jobs by the end of it, so this offseason was all about giving Trubisky the best environment possible to succeed, from the new coaching hire (Matt Nagy) to the personnel additions in free agency and the draft. Don’t be surprised to see this team catapulted in the right direction this season. The first move to take a look at is the hiring of head coach Matt Nagy, who spent last season as offensive coordinator in Kansas City at the helm of the best season of Alex Smith’s career. Nagy comes from the Andy Reid coaching tree, which also produced the offense Doug Pederson ran so successfully in Philadelphia on their way to a Super Bowl. If there’s one constant theme in these offenses, it’s constructing a system around the quarterback to simplify what they are asking him to do and improve his overall efficiency as a result. The clearest way to see this is how many run-pass options (RPOs) these teams use. RPOs are – much as they sound – packaged plays in which both a run and a pass play are taking place at the same time. Effectively the offensive line run blocks, the running back begins his track, but the receivers run pass patterns instead of blocking, then the quarterback can read whether to hand the ball off or pull it and deliver a pass instead. Much like read-option run plays, they are designed to stress the defense and put specific players in an un-winnable bind, an either/or situation where the quarterback simply chooses the option that exploits whichever choice that defender makes. The Philadelphia Eagles ran more RPOs than any other team in football last season, and only cranked up that rate in the postseason. 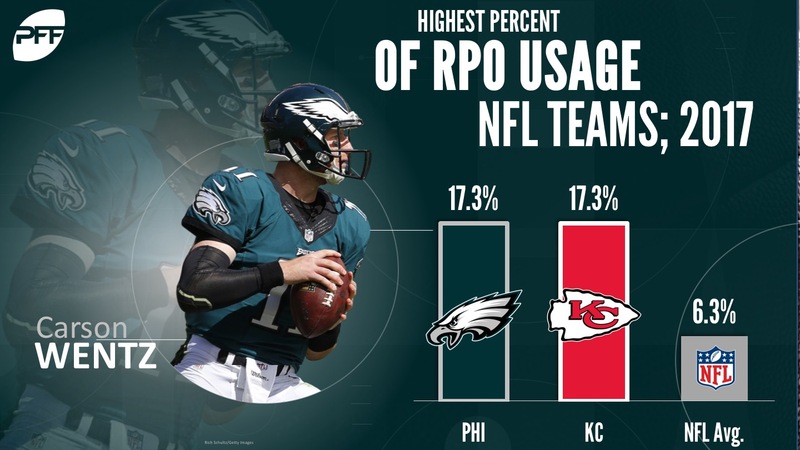 The Eagles and Chiefs tied for the league lead in percentage of plays that were RPOs (17.3 percent), almost three times the league average (6.3 percent). Contrasting that was last season’s Chicago Bears with a young and inexperienced Trubisky under center, who ran RPOs on just 2.7 percent of their plays, the seventh-fewest in the league. Nagy was a former quarterback himself, starring in the Arena League and briefly landing on the Philadelphia Eagles roster back in 2009, so he understands the challenges of the position and how best to streamline the job, which can only be good for Trubisky, whose college and NFL career combined right now sits at just 1,852 snaps, or less than two full seasons of play. Not only was Trubisky trapped in an unflattering scheme as a rookie, but he had arguably the league’s worst receiving corps to throw to. Chicago’s big push this offseason from a personnel standpoint was to give him weaponry. They signed the best available receiver in free agency in the shape of Allen Robinson, but also added Taylor Gabriel to fill a different role within the offense. Robinson is by no means a sure thing, coming off a down year in 2016, and then tearing his ACL three snaps into the 2017 season, but rewind further than that and you can find him making Blake Bortles, and Christian Hackenberg before that, look like a good quarterback. In 2015, Robinson led the league with 672 yards on deep targets (20-plus air yards). He caught 19 such passes (also leading the league) and dropped only one, giving the Jaguars one of the game’s best deep threats and providing the Chicago Bears with that same potential weapon. Gabriel is a short and shifty receiver that excels in gaining yards after the catch and turning receiver screens into big plays. When Atlanta went all the way to the Super Bowl in 2016, Gabriel averaged 7.8 yards after the catch, which led the league. He also has blazing straight line speed and can beat defensive backs running deep down the field if they lose their discipline and forget he has the potential to do that. In addition to those two wide outs, the Bears also signed TE Trey Burton to a significant contract. Burton may be best known for delivering the pass to Nick Foles on the ‘Philly Special’ play on fourth down in the Super Bowl, and his career is just 741 snaps old despite heading into his fifth season, but he is an athletic mismatch weapon at the position and could provide the Bears with a dynamic receiving weapon while second-year player Adam Shaheen becomes more of the blocker in their partnership. 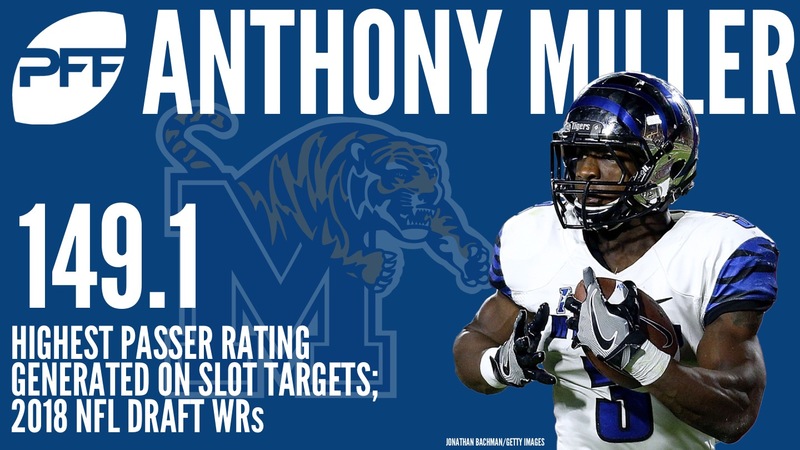 Finally, the Bears drafted Anthony Miller out of Memphis in the second round of the draft, a player that ranked 50th on PFF’s big board. Miller had an overall grade of 86.8 last season in college and played extensively both in the slot (41.2 percent) and out wide (55.4 percent) for the Tigers. He had 285 targets over the past two seasons, catching 32 touchdowns over that time. He broke 44 tackles over his three-year college career and has something of a poor man’s Odell Beckham Jr. skill set which should mesh perfectly with the rest of the revamped offense in Chicago. There of course remains the lingering threat that Kevin White may finally get on the field for an extended period of time and show something of what made him a high draft pick back in 2015. 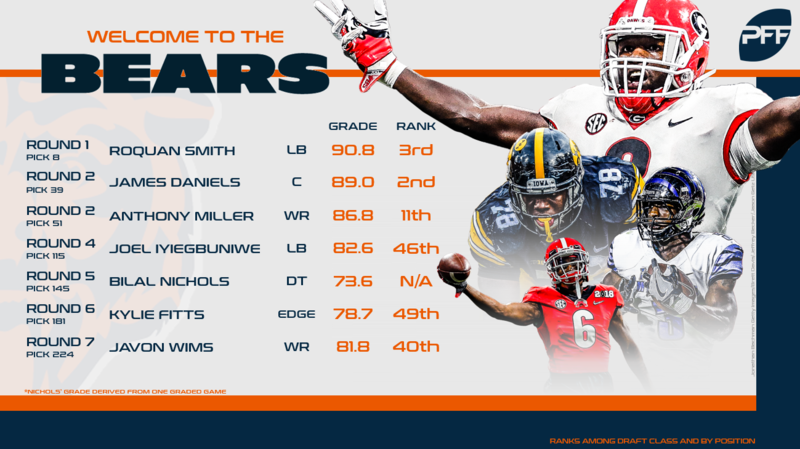 Finally, the Bears moved to solidify the offensive line, which should help both Trubisky, and the formidable running game they already have. Josh Sitton departed in free agency, removing the league’s best pass-blocking guard from their offensive line. Sitton has surrendered just 18 total pressures over the past two seasons, although in both years he missed playing time due to injuries. Into his position steps Iowa’s James Daniels, who will reportedly make the move from center in college to guard in the NFL. Daniels was a fantastic run-blocker, earning a PFF grade of 89.1 in that area last season, and he was particularly effective on outside zone plays. The Bears ran outside zone more than any other run concept last season and the Chiefs under Nagy were even more inclined to run that concept. 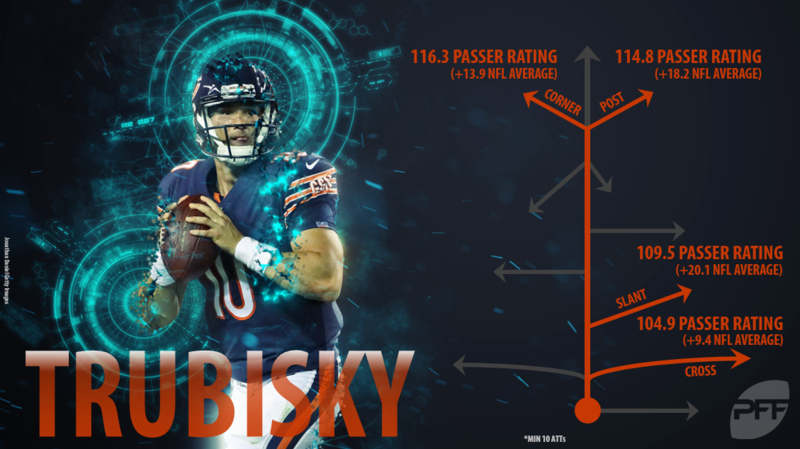 Trubisky earned an overall PFF grade of 75.6 last season playing in an offense that did not work to his strengths and with maybe the worst receiving corps in the game to throw to. This offseason was all about the Bears building around Trubisky to give him the best possible chance of justifying the trade they made a year ago to acquire him in the first place. He flashed the ability to play at this level as a rookie, particularly when the training wheels were taken off and the passing game expanded, but now we are going to see where his ceiling lies. 2018 should be an exciting season for Chicago fans.